Word of the day was “leeway” by TM T.
The title was “Return” by TM Y. This speech was a revival speech. The pathway program requires TM members to revise a previous speech and demonstrate it again. 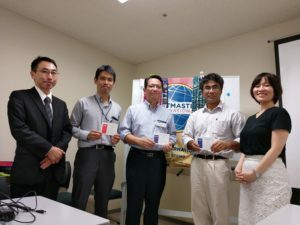 TM Y explained his career in the Tokyo International Toastmasters club. 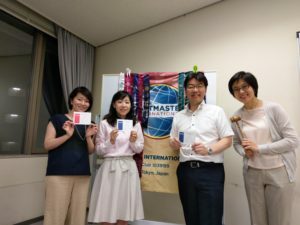 He once became the president of Tokyo International Toastmasters club and temporarily quit the club, and finally came back again. The speech introduced movement of his mind clearly. The title was “Innovative Planning” by TM T.
This speech explained how TM T thought of the innovating planning based on childhood experiences and present life. Evaluation for Prepared speech #1 by TM N.
Evaluation for Prepared speech #2 by TM S.
TM S said, “The speech is very attractive and fruitful”. Lastly, President TM A thanked TM T(TMOE) for her well-arranged meeting with full of humor. The Best Table Topics Speaker went to TM S.
The Best Evaluator went to TM Y. The Best Speaker went to TM T.
Word of the Evening, “be on a role”, was presented by TM.K.S. referring to TM.A.O.’s speech. He explained that his speech had the same title as he delivered at the last time. Since his objective was to apply the feedback, he rewrote the speech with the same name to remind the audience who had already listened to his speech. The main part explained his cross-cross cultural work environment. The backgrounds of his colleagues have a rich variety, so he focuses on learning the different cultures. For example, in India, people do not drink alcohol with family or colleague, but in Japan it’s quite common. You have to be careful to make jokes since they can have different meanings in an another culture. The same word indicates another explanation, such as Dew means metro in London. In conclusion, what’s important is to accept and be open to everyone. He’s working in a trading company which sells the chemical related to make credit cards. The speech showed the current situation of credit card industry and the uprising alternative cashless payment systems such as QR payments. He showed the graphs and charts of the market share of credit card, as well as the story from his own experience in business trip to France. The QR payments seem to exceed the credit card payments in the future since the cost is lower and the retailers pay less to use the system. There are several services of QR payments and each has pros and cons. In conclusion, TM.K.H. encourages the audience to try the new technology by showing a clear chart of comparison of major services. One of the guests, TM.S. kindly accepted the offer to evaluate the 2nd speech. He searched the speaker’s last evaluation beforehand and praised that he did improve his speech according to the advice he got. TM.S. said, however, that the speech had too much information and thus it was over the limited time. 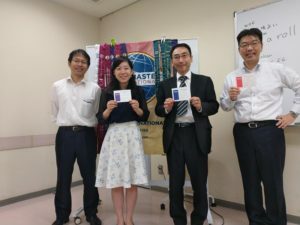 He referred to the winner of the speech contest and advised the speaker to make shorter speech and expand it to 7 minutes with gestures and poses. TM.J.S. evaluated the 3rd speech, saying that he liked the topic, which was about fin-tech. He pointed out 3 good points and one suggestion. Firstly, the speaker used the visual aid properly. Secondly, the research was appropriate and helped the audience to understand the basic information about the topic. The last good point was the speaker motivated the audience to use the new services. One suggestion was to simplify the slides, which sometimes had too many letters and charts. The evaluator concluded by saying that simple slides can help the speaker to send a strong message. TM.T.H. praised the TMOE to manage the meeting on time. He showed his appreciation to the second evaluator, TM.S., since he accepted the role although he was a guest from another club. He said, TM.S. gave the speaker a good advice referring to a champion’s story. 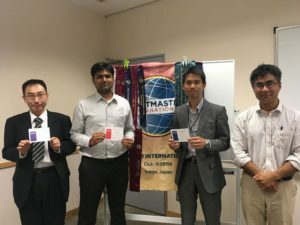 That came form his rich experience in Toastmasters. TM.T.H. said he liked TM.J.S.’s humorous opening, adding that the structure of the evaluation was clear. He agreed to the evaluator’s suggestion and advised the speaker to focus on at most 3 examples in one slide. The Best Table Topic Speaker Award went to TM.R.T. The Best Evaluator Award went to TM.J.S. The Best Speaker Award went to TM.A.O. Guest Mr.K was accepted to be a new member to TITMC. 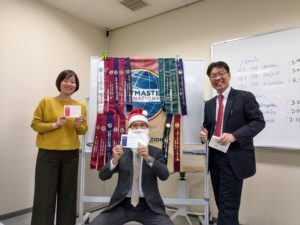 He gave a comment that his dream finally came true to be a toastmaster and was willing to help the club. His comment was strong and impressive! Welcome to our club and congratulations! The club meeting #306 was adjourned. It has been all day raining and it was a bit chilly evening time. One of the prepared speeches was cancelled, so that Table Topics session was add. TMOE(Toastmaster of the evening) was TM.A.O. who declared the opening and showed a little magic trick. The word of the evening was “intellectually” which was presented by TM J.I. who said that we were supposed to prepare the future with A.I. with our intelligence. We had one guest K.K. and the total participants were 11 on that day. TM M.Y. spoke how he had tried to explain the meaning of A.I. and how to deal with A.I. to his son. TM K.A. pointed out the speech expressed with simple and straight wording and it was nice sample of chatting/conversation which gave the audience to imagine the scene. Table Topics by TM A.O. TM A.O. gave the following 3 questions and appointed 3persons respectively. Question #1: What is your greatest skill? Question #2: Where you most like to go and why? Question #3: What stresses you out? The Best Speaker : TM M.Y. 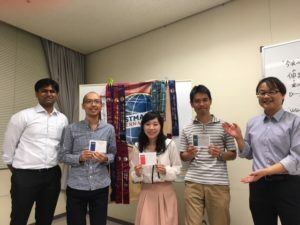 The Best Table Topics Speaker : TM S.E. The Best Evaluator : TM T.M. 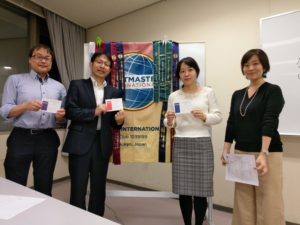 Tokyo international Toastmasters Club Meeting #303 Meeting Report on Sep.12,2018. 今回のTMOE(Toastmaster of the evening)であるTM T.M. And ,he introduced following phrase as Word Of The Evening in English ,too. It is the same meaning as “伸るか反るか” in Japanese . First prepared speech speaker was TM J.I.. Her speech title was “My Summer Vacation #2 “. The purpose of this speech project is about “Evaluation & Feedback”. She successfully completed this speech objectives with reflecting the feedback of her last speech. We really enjoyed her lively vacation story. Her speeech evaluator was TM R.T..
She praised that the speech was full of the friendliness for audience. And she suggested adding more vocal variety for more lively speech. Second prepared speech speaker was TM K.A..
His speech project was about storytelling. He shared a story of Muhammad Yunus who was awarded the Nobel Peace Prize for founding the Grameen Bank. His speeech evaluator was TM A.O.. He said TM K.A.’s speech was full of humanity . And he mentioned it was easy to understand because of TM K.A.’s visual aids and excellent speech construction. 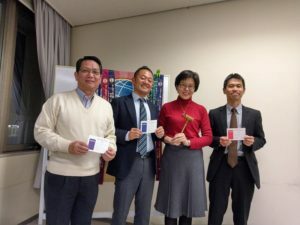 The Best Table Topics speaker:TM T.M..
Toastmaster of the evening was TM K.M. The word of the day was “Encourage” by TM A.T. The title is “My Summer Vacation”. She talked about her summer vacation going to Tohoku. Along the way to camping site, her car roof stuck at tunnel! The car roof was broken. She slowly drove and finally found “Autobacks”. The title is “Cross culture communication”. He talked about his team diversity. The team 9 members are coming from 9 countries. The native English speaker is only one member from US. He also talked about the difference of high context culture and low context culture. Then he talked about the importance of greeting and communication as his message. His speach was the Japanese traditional folk tale “Momotaro”. He vividly expressed the scene of duel, Momotaro vs devils. His vocal variety was excellent and I enjoyed the Momotaro story very much. Evaluator TM A.O. evaluated TM J.I..
Evaluator TM K.S. evaluated TM B.H..
Evaluator TM A.S. evaluated TM C.Y..
Due to the typhoon, Aug. 8th meeting is CANCELD. Please be careful the heavy rain and strong wind. Let’s meet at 8/22 meeting!